Diagnosing autoimmune diseases can be difficult given that there’s usually no one specific blood or imaging test to confirm the presence of them. And when two autoimmune conditions share similar symptoms — as lupus and rheumatoid arthritis (RA) do — rheumatologists sometimes face an added challenge. 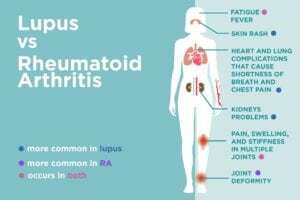 “If a patient has a more mild case of lupus and only the joints are affected, it can look like RA,” says Sandeep Krishna Agarwal, MD, PhD, a rheumatologist, physician scientist, and an associate professor and section chief of the Section of Immunology, Allergy & Rheumatology at Baylor College of Medicine in Houston. Both lupus and rheumatoid arthritis can cause joint pain, swelling, and stiffness. The joints most commonly affected — the small ones in the fingers, wrists, knees, ankles, and toes — are the same. The symptoms are typically symmetrical, which means that both wrists are affected, for example, rather than one or the other. People who have lupus or RA can also experience morning stiffness lasting for at least an hour. Despite the similarities in the symptoms of lupus and rheumatoid arthritis, people with lupus often experience additional symptoms that typically aren’t seen in those with RA. 1. Lupus often causes a rash. The most common rash is the malar or “butterfly” rash, so named because it covers the cheeks and bridge of the nose, creating a shape similar to a butterfly spreading its wings. Rashes can also appear elsewhere on the body, typically in areas that get sun exposure (like the chest). Lupus can also attack other organs, such as the heart, lungs, and kidneys (more on kidneys below). If the lungs are affected, a person may experience shortness of breath and pleurisy, an inflammation of the linings of the lungs and chest that causes chest pain when you take a deep breath. If the heart is affected, it can also cause shortness of breath as well as chest pain that changes when you lean forward. The presence of kidney-related symptoms can really set lupus from RA because the kidneys usually aren’t directly affected by RA. Signs of kidney involvement include swollen ankles and excessive bubbles in the urine. In severe cases of lupus, the brain may also be affected, which can cause mental fogginess, confusion, memory loss, and even stroke. With no definitive test for RA or lupus, rheumatologists must instead rely on a patient’s medical history, physical exam, and blood, urine, and imaging tests to make a diagnosis. Rheumatologists also check for the presence of certain autoantibodies in the blood to help make their diagnosis. The most basic test is the antinuclear antibodies (ANA) test. People with lupus are almost always positive for ANA; however, people with RA sometimes test positive as well, as do some healthy people. If you get a positive ANA result for lupus, your rheumatologist will then order additional autoantibody tests — including anti-double stranded DNA, anti-Smith, and antiphospholipid tests — that help confirm a diagnosis of lupus. If RA is suspected, your doctor will order tests that are more relevant for RA. These include rheumatoid factor and anti-cyclic citrullinated peptide (anti-CCP) antibodies, as well as tests that measure inflammation in the body, such as erythrocyte sedimentation rate (ESR) and C-reactive protein (CRP). Imaging tests such as X-rays can be very helpful in determining the correct diagnosis of lupus vs. rheumatoid arthritis. This is because lupus, unlike RA, rarely causes joint erosions. Your doctor may also order a chest X-ray if you’re experiencing symptoms such as shortness of breath that could indicate lupus; urine and blood tests can show whether your kidneys have been affected. If you’ve been experiencing symptoms of lupus or RA, it’s crucial to see your doctor as soon as possible. The good news, he adds, is that with such a wide variety of treatment options available for both conditions, RA and lupus are becoming easier to manage. Some medications are helpful for treating the two diseases, including NSAIDs, corticosteroids, anti-malarial drugs such as Plaquenil, and immunosuppressive medications like methotrexate. Treatment varies more when RA and lupus are more severe: A person with RA may be treated with biologics, while someone with lupus would likely be treated with stronger immunosuppressive drugs, Dr. Agarwal says.